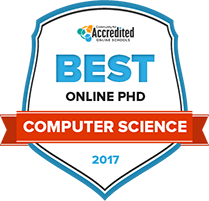 What are the Best Online PhD in Computer Science Programs of 2018? Computer science is a burgeoning academic and career field. According to the National Center for Education Statistics, the number of PhD graduates in computer science more than doubled between 1995 and 2011. An online doctoral level degree path is designed to afford graduates flexibility both in their academic and career pursuits. Learn more about the online PhD in computer science, what to expect during the application process, how degree programs are structured and what graduates can do after receiving their degree on this page. Although computer science is one of the most popular degree areas, not every university and computer science department is created equal. It is important to understand what differentiates each online PhD program in computer science, and our 2017 rankings are a helpful jumping off point in the decision making process. At Southern Methodist University, Lyle School, students are provided with an extensive doctoral degree program in computer science. This institution focuses on engineering and technology which gives students the most current and comprehensive PhD curricula to advance their research and professional application of the field. With small class sizes, faculty are able to give specialized attention to individuals. Virtual classrooms are also widely offered which allows students to partake in the program through interactive online platforms and digitally-recorded instruction. Scholarships and financial aid are also available for eligible students. Nova Southeastern University’s prestigious doctoral program in computer science allows students to receive their PhD through a minimum of 64 credit hours. NSU’s “cluster format” for courses gives students the opportunity to complete their program through online courses and four in-person sessions. Graduates of the program will learn the skills necessary to research, analyze, understand and advance their comprehensive knowledge in computer science. To help students achieve their academic goals, NSU provides updated computer labs and research facilities including laboratories and libraries. NSU also encourages doctoral students to participate in hands-on internships to apply their academics in a professional setting. Columbia University in the City of New York offers doctoral students a choice of a PhD in computer science or Doctor of Engineering Science (DES) degree. Graduate students begin as apprentices and junior colleagues and spend at least half of their studies as active participants in mentored research. During the first two years of the program, students are expected to perform community service within the department. Prerequisite requirements include completion of the foundation course, Analysis of Algorithms. The breadth requirements include coursework in areas of artificial intelligence and applications, systems, and theory. University of California-Berkeley, founded in 1868, has more than 170 academic departments today offering degree programs. Over 10,455 attend UC Berkeley graduate degree programs. The Berkeley PhD from the Department of Electrical Engineering and Computer Sciences (EECS) combines coursework with requirements to conduct original research. With full-time studies, students can complete the PhD in 5-6 years if starting with a bachelor degree or in 3-5 years when starting with a Master's. Applications are accepted in December, with the program beginning the following fall. Students may benefit from the proximity of the university to Bay Area and Silicon Valley engineering companies. The PhD in computer science program at the University of Minnesota will give students the opportunity to improve their knowledge and understanding of the field while building prestigious credentials that will help them advance their careers and conduct scholarly research and application. Applying to this programs requires all students to demonstrate academic interest which ensures an academically challenging and motivating environment surrounded by like-minded peers. Students are also encouraged to build their professional and networking skills by getting involved with computer science related professional organizations such as Women in Computer Science, Computer Science Graduate Student Organization and the Association of Computing Machinery. University of North Texas is located in Denton, just over 30 miles from Dallas/Ft. Worth. It is home to more than 30 doctoral programs in the arts and sciences. Offered by the Department of Computer Science and Engineering, the PhD in Computer Science degree program requires completion of 72 credit hours beyond the bachelor degree or 42 credit hours beyond the master's. In addition to undertaking the credit hours of coursework, PhD students are required to pass an oral exam on their research topic and complete a scholarly research dissertation to complete the degree. Syracuse University offered its first engineering courses in 1877. The university established the Center for Advanced Technology in Computer Applications and Software Engineering in 1984 and the Center for Information and Systems Assurance and Trust (CISAT) in 2010. The PhD degree in Computer and Information Science and Engineering (CISE) requires completion of 52 credit hours beyond the BS degree. Students sit for the written qualifying exam at the end of the first year, with the oral exam scheduled in the second year. They must pass a proposal defense by the end of the fourth year and the defense of their dissertation within four more years. Graduate students interested in furthering their education may be interested in considering Mississippi State University’s online computational engineering doctoral program. The distance learning programs offered at MSU allow students with busy schedules to find time for academic advancement. Financial aid is available to MSU student in the form of scholarships, grants, and student loans. MSU offers a number of student services—including academic advising, tutoring, and career help—to ensure students are on track to achieve their life goals. MSU is an active community and is proud to host over 100 student-operated clubs and organizations. Students attending Pennsylvania State University may earn their doctoral degree in computer science and engineer. Like many of Penn State’s programs, this degree track allows for hybrid course scheduling, with both online and on-campus classes. Paying for college is made easy at Penn State with the thousands of dollars in scholarships, grants, and financial aid that is awarded to students every year. All of Penn State’s campuses feature modern and comfortable student housing and dining facilities. On-campus activities include intramural and club sports, arts performances, and participation in one of Penn State’s many student-run organizations. Once accepted into the University of Southern California PhD program, students will learn the necessary skills to pursue a career in advanced computer science. This prestigious program allows students to work and network alongside professors and scholars in this field. Students can earn funding towards their degree through USC-approved fellowships Resources for this program include scholarly writing assistance through their American Language Institute where peers edit scholarly writing specifically for the PhD students. With many award-winning alumni, USC seeks to prepare students to excel in their career paths through expert education, networking, fellowships and leadership. For those considering a doctoral degree in computer science, it can be challenging to compare institutions to and get a true understanding of all the options. Use our search tool below to narrow down a list of potential target schools by PhD degree level, tuition and fees, institution type and student enrollment. A PhD in computer science does not limit students to careers solely in academia. It is a credential that is in growing demand in both public and private spheres, which may be why more people are pursuing this doctoral level degree. Find out more about what it takes to earn a PhD in computer science, from the process of applying to all the way to graduation requirements with the timeline below. Generally speaking, there are limited openings in computer science PhD programs each year, as more and more qualified applicants attempt to enter the field. It is a competitive space, which means prospective students should have a firm understanding of the admission requirements prior to applying to graduate programs for computer science. Students must meet minimum GPA requirements for admission into a PhD in computer science program, with many programs listing a 3.5 out of a 4.0 scale as a competitive GPA. Students should have a bachelor’s degree from an accredited university with preparatory coursework in computer science and related fields. Graduate Record Examination (GRE) scores for the verbal, quantitative and analytical sections are required for doctoral level computer science programs. Most programs have a score threshold, such as 304 and 3.5 or higher on analytical writing. The Test of English as a Foreign Language (TOEFL) test is required for PhD level computer science applicants who have either not studied in the United States for at least one school year or whose native language is not English. Applications should include three letters of recommendation, including two from former professors who are familiar with the student’s academic background and potential as a PhD student and professional researcher in computer science. The statement of purpose expresses the student’s academic plans and interests in computer science and explains why the student is a strong PhD candidate. The first year of an online PhD in computer science program establishes the student’s program of study and sets the foundation for the next three to four years of doctoral level study. During the first year, students are integrated into the research activities of the department and become oriented to being a doctoral student. During the first year, computer science PhD students should identify research interest areas, such as data management and analysis, graphics and visualization or robotics, and find a research advisor from that study area. Working with a graduate advisor, each doctoral level computer science student will create a plan of study for coursework and future research by the end of the first term of study. Common areas of study include computing systems; theory of computation; artificial intelligence; programming languages; and computing applications. Computer science PhD students spend the first year engaged with core computer science coursework in topics such as computer systems; intelligent systems; computer science theory; and programming systems. Year two consists of accomplishing three major milestone: completing core course requirements for the computer science PhD, transitioning into formal PhD candidacy and preparing for independent dissertation research. During this time, students learn the basics of becoming a researcher. In the second year, each doctoral level computer science student is required to assemble an advisory committee consisting of three faculty members, including one from another department. This committee administers the qualifying examination. Computer science PhD students must complete the required coursework that demonstrates they have the ability to read, analyze and understand technical aspects of the field. After completing their core coursework, students take a qualifying computer science PhD examination. This examination has an oral and written component that assesses the students’ knowledge of their academic specializations, broad knowledge of computer science and ability to defend a position through an oral examination. The third year of a computer science PhD program revolves around elective coursework on the student’s academic track and starting the process for writing a formal dissertation. Students will also formally apply for PhD candidacy. Upon completion of coursework and qualifying examination, computer science students have met the criteria to apply for PhD candidacy. The application consists of a portfolio of work, such as exams, classwork and a piece of research that is written under the supervision of the study’s research advisor. Typically, these are technical papers or a research paper that can be submitted to a peer-review journal. After being admitted to PhD candidacy, computer science students may form a dissertation research committee of three to four faculty members. The dissertation committee guides the research and dissertation writing process. After completing the qualifying examination and achieving candidacy, computer science PhD students may write and submit a written research proposal for their dissertation. Students must defend their proposal through an oral examination with their research committee. The fourth year of the online PhD in computer science program is dedicated to scholarly research and work on the student’s dissertation. This year culminates in preparing to submit and defend the dissertation. After completing coursework and comprehensive examinations and defending a thesis proposal, computer science PhD students can start their dissertation research under the guidance of the research committee. As they start work on their dissertation research, doctoral level computer science students actively present their research to internal (departmental) and external audiences through doctoral research seminars, conferences and workshop talks. In some programs, computer science PhD students must demonstrate their technical skills by writing a piece of software. This project requirement can be satisfied through independent research, a class project or part of an internships. The final year of an online PhD in computer science program is dedicated to completing, submitting and defending the dissertation. The PhD student must present original research to the research committee and schedule an oral defense. Typically, the defense is open to the public and includes a thorough set of questions that ask the student to demonstrate the significance of the research. After being reviewed by the research committee, a doctoral level computer science student makes revisions to the dissertation and submits it for final approval. Once approved, the student may apply for graduation. The student receives a PhD in computer science once the completed dissertation is filed with the university’s graduate school. Typically, the application to graduate and final dissertation must be filed at least 30 days prior to graduation. The goal of online doctoral programs in computer science is to produce well-rounded graduates who demonstrate a depth of understanding in their specialized area of study. Although these programs are flexible and allow for a great level of independence, students must complete several requirements in order to graduate. PhD level computer science students must complete between 30 and 36 credits from standard (non-seminar) graduate classes. Of that number, 15 to 18 must be courses in computer science. Topics of study include algorithms; computing systems; artificial intelligence; scientific computing applications; programming languages; and theory of computation. Between three and five credits must come from PhD level computer science research seminars (700 level courses and above). These courses include oral presentations on the student’s in-depth research. Example topics of study include theoretical research, computing systems research and applied computing research. Approximately 24 of a computer science student’s credits must be in doctoral research courses. Some online PhD programs in computer science have a residency requirement, where students have to complete on-campus coursework or attend on-campus program sessions. During their course of study, PhD level computer science students may also spend at least one semester as a teacher or teaching assistant. Students typically teach a one to two credit undergraduate computer science course. Computer science PhD students must successfully complete qualifying examinations and successfully defend an original dissertation in a computer science research area to graduate. The primary goal of online PhD in computer science programs is to graduate students who are prepared for computation-based careers — in academia, government and the private sector. Graduate students develop analytical skills, foundational knowledge of computing theory and advanced computation abilities in systems, programming languages and technical tools. Demonstrate knowledge, understanding, applications, analysis and evaluation of the three different value systems of the three PhD level computer science research styles that differ in how they evaluate and validate research results. The three different research styles are theory, systems and applications. Computer science PhD students gain an understanding of the core areas of computing science, including programming languages, computation theory, algorithms and computing systems and applications. They have an ability to craft critical solutions to challenging computing solutions, design software systems to tackle problems and apply advanced mathematical concepts to computing application and software development. PhD students develop the ability to use a variety of mathematical concepts, such as discrete mathematics, to drive new thinking in computer science. By leveraging advanced mathematical tools, computer science PhD graduates can develop original approaches to programming and build upon existing technical theories to create new solutions to problems in arenas ranging from automation to software development. There is only one way to describe career prospects in computer science: growing. PhD graduates can pursue career opportunities across academia, private industry and government. The Bureau of Labor Statistics projects double digit growth nationally between 2014 and 2024 in a range of technology-based career fields, including for computer scientists and software developers. Explore four potential employment avenues a PhD in computer science could lead to in the table below. Computer scientists use their programming and analytical skills to solve problems in nearly every field, from environmental engineering to video game design. They may write algorithms to mine financial data, design robots to tackle manufacturing issues, or write new software used by a navigation system in a vehicle. Using skills in data modeling and knowledge of computing systems, computer systems engineers design efficient and effective computing information systems for universities, K-12 schools, government organizations and private organizations. Computer science professors conduct original research into specialized fields, such as robotics or artificial intelligence. In this role, they also teach undergraduate and graduate courses to prepare the next generation of developers, programmers and computer scientists. Network architects are the people who design, developer and build data communication networks. These might include the networks businesses use for internet and intranets, data connections between multiple companies and locations, or cloud infrastructures that serve a multitude of users. Computer science is a dynamic field with numerous educational and career choices to consider. Prior to enrolling in a graduate program, students may want to use the resources below to learn more about the field, networking opportunities or professional paths after graduation. The American Society for Engineering Education is a membership-based nonprofit organization that works to promote technology education. The American Society for Information Science and Technology is dedicated to improving techniques and theories in computer science. The Association for Women in Computing is a professional organization for women working in technology and offers local chapters throughout the country. The Computer Research Association is a membership-based organization that is active in computer science departments at more than 200 colleges in the U.S.